The national trend for monthly sales remained stable in December, with seasonally adjusted sales activity having edged down by less than a percentage point from the previous month. Led by Calgary, Winnipeg, and Hamilton-Burlington, seasonally adjusted sales activity was up month-to-month in half of local markets. Toronto, Vancouver, and Montreal were among the markets that posted a small month-over-month decline in December. National home sales activity improved steadily over the second half of 2010, with seasonally adjusted sales up 18.3 per cent in December compared to the recent low reached in July. As a result, seasonally adjusted activity in the fourth quarter of 2010 rose 12.1 per cent from third quarter levels, and was up less than a percentage point compared to second quarter activity. Some 447,010 homes traded hands over Canadian MLS® Systems in 2010, down 3.9 per cent from 2009. Annual sales activity was higher than CREA had forecast previously due to stronger than projected sales activity in the fourth quarter. The number of new residential listings on Canadian MLS® Systems held steady in December, rising by less than one percentage point on a seasonally adjusted basis. New listings remain 14.2 per cent below the recent peak reached in April 2010. The housing market remained in balanced territory on a national basis in December, with sales as a percentage of new listings amounting to 55.2 per cent. Just over half of local markets in Canada were in balanced territory in December. 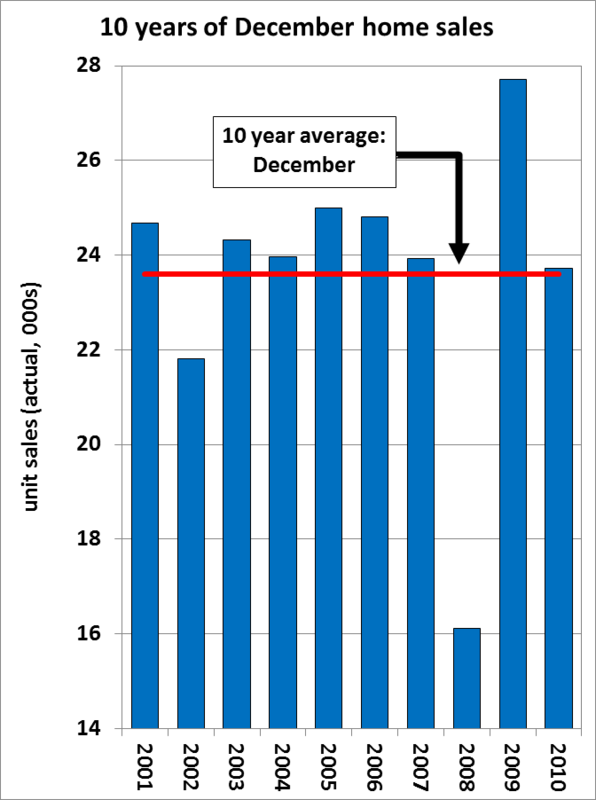 The number of months of inventory represents the number of months it would take to sell current inventories at the current rate of sales activity, and can be used to gauge the balance between housing supply and demand. The seasonally adjusted number of months of inventory stood at 5.8 months at the end of December on a national basis. This was unchanged from November, and remains 1.4 months below where it was in July. The number of months of inventory in December rose compared to November levels in British Columbia, Saskatchewan, Quebec, New Brunswick and Nova Scotia, and was down from the previous month in Alberta, Manitoba, Ontario and Prince Edward Island. The national average price for homes sold in December 2010 was $344,551, up two per cent from the same month last year, and stable compared to average price in October and November. About 60 per cent of local markets recorded year-over-year gains in December. Average price was down on a year-over-year basis in 30 per cent of local markets, and remained stable in the remainder. The annual average price for homes sold via Canadian MLS® Systems rose 5.8 per cent to $339,030. Much of the increase reflects compositional factors within and across housing markets that caused average price to be skewed downward in 2009.